I don’t have too much to show in the way of purely-defensive tools. I do feel that offensive tools have a strong place in the defensive arsenal, so you may want to check out tools I have listed there. I’m very concerned about the threat of wireless driver exploits. Tools like the Metasploit Framework make exploiting wireless driver vulnerabilities fairly straightforward. WiFiDEnum is a tool while working for a former employer (Aruba Networks). It is a simple tool written in C# using .NET 2.0 that enumerates a Windows XP, Vista or 2003 device for the wireless drivers that are installed. Once the list of drivers is retrieved, WiFiDEnum uses a local Microsoft Access database and identifies any drivers that are known to be vulnerable. After running a scan, the administrator can generate a HTML or XML report identifying the drivers installed and any vulnerabilities. 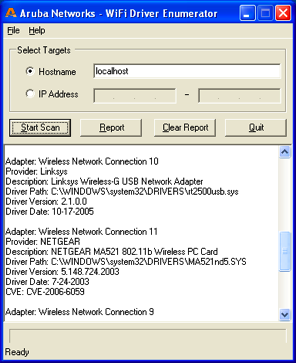 You can scan the local system, a single remote host, or a range of IP addresses. More information about WiFiDEnum is available at labs.arubanetworks.com. WiFiDEnum is made freely available under the Aruba Free Software License.